Did you ever consider the correlation between building a house and writing a book? This year, we’ll explore those similarities, one each month, taking the book-writing process from blueprint through construction to sale. Beginning writers, I invite your questions and comments. Contractors (published writers) and subs (editors, proofreaders, book and cover designers, marketers, etc. ), I invite you to share your expertise. • Putting up the For Sale sign – donning a realtor’s hat. Blueprints detail placement of plumbing and electrical fixtures; locations and measurements of rooms, doors, and windows; roof pitch; etc., to make the completed structure to be habitable and functional. How does this relate to writing a book? This “blueprint” maintains character integrity and story flow because we don’t have perfect memories. My editing days abounded with characters that changed hair or eye color, places of birth, physical sizes and attributes, and a host of other inconsistencies that befuddle readers. Following detailed character sketches keeps characters true to themselves and consistent in appearance, and consulting an outline (plot map) keeps the story on track. Digression comes too easily; and interesting as a new path might seem, its inclusion may disrupt your flow. Stay focused—yet be open to suggestions by your characters. Let them to tell you their story; they may choose a route that works better than yours. It’s okay to change the blueprint if the new design improves the story. For example, the antagonist in my first book changed my planned ending. Had I not let him show me the path he needed to take, I would have forced a climax that didn’t work nearly as well as his. 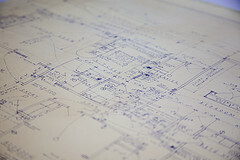 Do you create “blueprints”? Have your characters ever changed your story? Linda Lane is channeling her years of editing experience into a cozy new hangout for writers. Her website, still under construction, will feature a bookstore, blog, contests, Q and A discussions, serialized stories, and more. Visit her at DenverEditor.com and LindasBookNook.com. I have written character sketches and they help. However, I hate outlining. So I compromise. I keep an excel spreadsheet open when I write. When I come up with a new name or new place, I plug it into the spreadsheet with a description of what/who it is and why it is important to the story. I alphabetize my list. So when I get to page 200 and can't remember what I called the town on page 10, I can just flip over and look at the spreadsheet. This combination of character sketches and "record keeping" seems to work for me. I love the construction analogy. I'm painting my house and know this for certain: good prep work saves you a lot of aggravating clean up later! I have written a book and built a house ... all I can say is that I rather enjoyed writing the book. Love your spreadsheet idea, Liza! IndyWriterGirl, whatever we can do in the beginning to avoid grief later makes great sense. Ditto on Liza's Excel ideas; I recently saved a fellow writer's sanity with this one! Another benefit: If you keep up your spreadsheet with chapter synopses, at the end, you can concatenate them to get a great start on a full synopsis. For The Drowning God, the initial concatenation was about 3,000 words, which gave me plenty to rework into a five act/two goal structure in a neat 990 words. Another benefit: When your character emerges suddenly and DOES change your story, it's a lot easier to rearrange chapters and see what has to be adjusted to fit! One of my books is almost through being constructed. I will go over there today and get more done! I outline with gusto. I have every (I think) scene written in order. I also do character bios for my main players. I know writing is creative, but I try to impose as much control as possible. It makes setting realistic goals much easier. I can say "write three scenes today" and I know exactly which scenes I'm writing. James, more great uses for Excel. Thank you. I may even learn to make use of it myself — I like what I'm reading here. Morgan, I have several starter homes — starter in the sense that they have only been started. Lots of work still to do. Glad to hear your latest project is almost ready for the finishes. Elspeth, I need an outline and characer sketches to augment my cluttered memory. I hate the "I-know-I-wrote-that-somewhere" scenario when I'm trying to find something to see if I included the correct information . . . or to change information that has taken a new direction. Control is good. A spreadsheet as noted above might make it even better. I wish! I'm a total pantser. When I was writing, I kept hoping I'd have a publisher want a 3 book deal (or better), so I was reluctant to write my books as a series, knowing it was highly unlikely they'd pick up book 2 if Publisher A had contracted book 1 (and publisher A didn't buy series; you had to write the book and resubmit the entire thing). Right now, I'm writing book 5 in my Blackthorne series. I realize I need actual "blueprints" for so many details beyond character descriptions. What floor is the boss's office on? Can you see the kitchen from my heroine's front door? As for a character changing a book -- heck, yes. I was going back through my Blackthorne books to see what I'd already written about the would-be hero of book 4. Imagine my shock when I discovered a throwaway line that indicated he had a kid. Try writing a romantic suspense with that extra character! (I do like to think I pulled it off). As the saying goes, Terry, the devil's in the details (or something like that). The problem, of course, is keeping them straight. I'm more of a pantster type writer. Once I'm done, though, I create a Book Bible as I re-read. I use that to check the timeline and names and details and other things I need to know to make sure I haven't make mistakes. Book bible/check list — great idea, Helen. I love the sharing here because it emphasizes that one size does not fit all. We do whatever works for us to make our books work for our readers. Thank you all for your comments! Actually, my editor was thinking about offering a "Bible" as one of her services, and she asked if she could use one of my books as a learning experience. We've been discussing what belongs there and how to organize it. Good timing. Terry, please keep us posted on how this works. I have a hybrid approach: I list the emotional turning points I'll need to create a believable character arc, then aim for them panther-style. This seems to give me the guidance without choking off creative impulse. Interesting approach, Kathryn. Panther-style? As in stalking? Yes! I like it. I'm a total pantser too so no outlining. No, that's not true, I do outline but after a first draft. I write a zillion synopses and do hero's journey thingys and mindmaps and beat sheets BUT only after I have a first draft. My partner is a house builder and I often think of the comparison - especially since I was writing my first book when he was building our house - so many late night conversations in which we'd change the plans before it was built. I look forward to reading your blog and see how the comparison goes! I'll be back. We're designing our next house right now.